Drew Pomeranz picks up 16th victory. 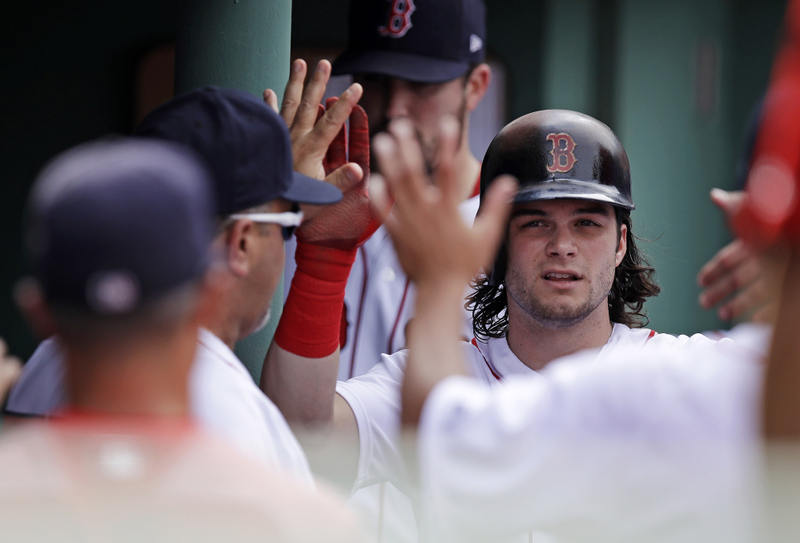 BOSTON — Drew Pomeranz pitched six innings of one-run ball, and Andrew Benintendi had three hits and drove in three runs to lead the AL East-leading Boston Red Sox past the Oakland Athletics 6-2 on Thursday. Ryon Healy hit a solo homer for the A’s, who fell for just the second time in eight games. The loss assured Oakland (64-82) of a losing record for the third straight season. Trailing 1-0, Boston tied it when Vazquez’s drive completely left Fenway over the Monster seats leading off the fifth. The A’s had taken a 1-0 lead in the top of the inning on Josh Phegley’s sacrifice fly. Red Sox: LHP David Price (left elbow inflammation) was activated off the 10-day disabled list. He had been sidelined since July 28. Manager John Farrell said the plan is for him to work out of the bullpen. … Farrell inserted 2B Pedroia into the DH spot to get him off his troublesome left knee that landed him on the DL for nearly two weeks last month and sat struggling regular DH Hanley Ramirez. Pedroia extended his hitting streak to 27 games against Oakland. During the streak, which started July 14, 2013, he’s batting .421. Athletics: RHP Daniel Mengden (0-1, 7.07 ERA) is set to make his first career start against Philadelphia on Friday when the A’s face RHP Mark Leiter Jr. (3-5, 4.84) and the Phillies. Red Sox: LHP Sale (16-7, 2.76 ERA) is in line to start against Tampa Bay RHP Matt Andriese (5-3, 4.46) Friday when the Red Sox open their final road trip of the regular season. It’s scheduled to be the Rays’ first home game since Hurricane Irma hit the area last weekend.